MIDGES are causing chaos across the country with Scot’s claiming it’s the “worst year ever” so far for the ravenous flies. They may have arrived a little bit later due to an unusually cold start this year, but midges are back with a boom and terrorising Scot’s. Lucy Fraser, from Rowardennan, Stirling, says she has become a prisoner in her own home and revealed that a contractor was forced to stop laying new decking at her property because the midges were so bad. And Scott Sweeney, from Argyll, who works outdoors as a deer manager says midges have “exploded” this week and are the “worst ever”. Dr Alison Blackwell, from the Scottish Midge Forecast, back the claims yesterday (wed) and said that despite the slowest start to the midge season in three years – midge spray has been flying off the shelves this week as they reemerge. Midges typically begin to emerge during the end of May, and in June the female biting midges arrive to kick off the season. In 2017 a record number of 68 million midges descended on Scotland – a 40% rise on the year before – but experts have not revealed this years’ estimated figures. However, Scots across the country have taken to social media to share their midge misery. Lucy Fraser runs her home as guest house for walkers taking on the West Highland way and has to give them a stern warning not to open the windows – or suffer the consequences. The 57-year-old posted a photograph of midges infiltrating a lamp outside of her home. In the space of last week hundreds of the tiny critters filled up the glass case almost to the halfway point. Speaking today (thur), the hotelier said: “I insist the guests don’t open the windows. If they it’s horrific and believe me some do and regret it. 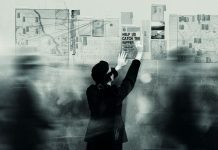 “Each year from the end of May to October I become a prisoner and wouldn’t dare go out the door before 10am and after 5pm. This is when the midge is at its worst, the sun keeps them away but the rain attracts them. The mum-of-eight added: “Trying to get tradesmen to work here between May and October is impossible as no one could work outdoors without being driven insane. “I’m trying to have a deck area built and the guys said hey have never seen anything as bad and even though I gave them a huge fan they said they had to abort the job. 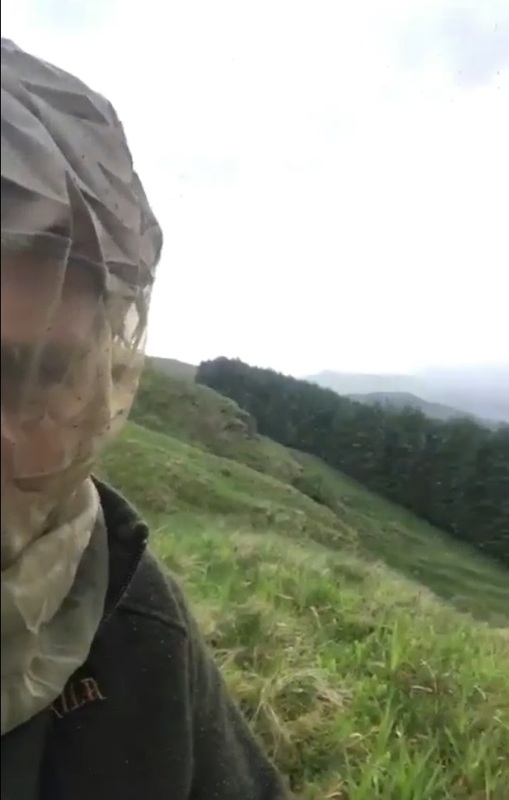 Scott Sweeney, from Inveraray, Argyll and Bute, works outdoors as a deer manager says the midges make if difficult to get any work done. 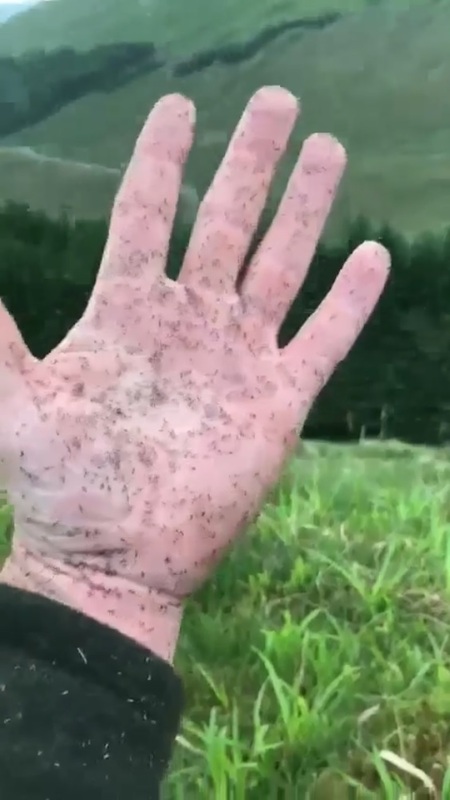 The 31-year-old shared a video clip of hundreds of tiny midges clinging to his hands and buzzing around him as he sat on a hill with his dog Leah. The post gathered over 1,400 likes and was shared over 1,200 times as Scot’s warned each other to be prepared when hitting the outdoors. Social media users were quick to share their shock at the state of the midges already. Lynn Bindon said: “A zombie apocalypse has nothing on Scotland’s midge season. Dr Alison Blackwell, from the Scottish Midge Forecast: “This year has seen a late start to the midge season. However this week we have seen very high levels of midges. “This is usually reflected in the the amount of insect repellant we sell. It’s been slow the previous weeks but this week we have seen very high sales. We have had lots of people calling. “It seems particularly in Wales, Ireland, and the Highlands of Scotland where it appears to be the worst at this time of year and where we are getting most calls from. The Scottish Midge Forecast posted a update on their website on May 25th, confirming the slow start to the season. It reads: “2018 has seen the slowest start to the Scottish midge season since 2015, when we had very similar cool weather in April and May, which delayed the first emergence of the midges from their overwintering habitat as larvae just below the soil surface.